If you’ve not yet had sangria, you’ve been missing out. 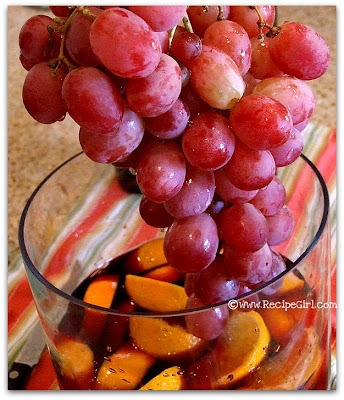 Fruit combined with wine… sometimes juices or liqueurs too… makes an amazing adult beverage. 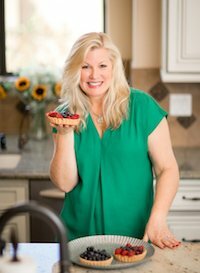 I tend to make white sangria recipes in the summer and red wine sangria recipes in the cooler months. That’s just my preference. 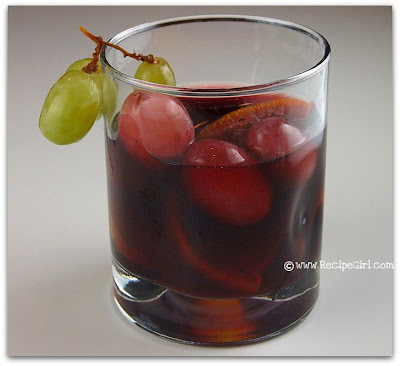 For a Spanish tapa’s themed party we attended this past weekend, I brought along a new sangria recipe: Grape Sangria. 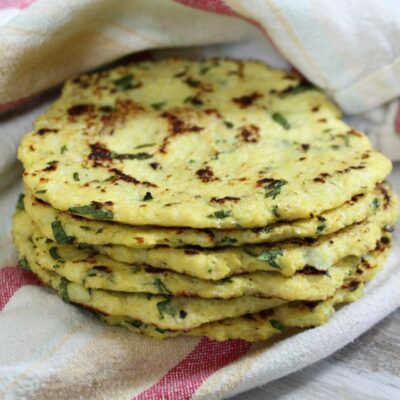 This is a really basic recipe, without a lot of fancy stuff added in. I doubled it by using two bottles of red wine that were on the cheaper side (no need to buy the high end stuff for sangria). I used Valpolicella, but any dry red will do- a Rioja is good to use too. Add sliced pear (or nectarine or peach if they’re in season). Stir in honey to taste. 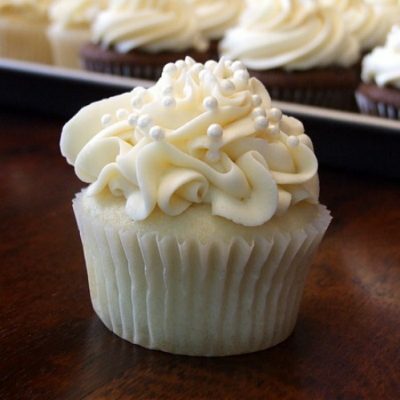 As the recipe is written, it’s not very sweet. 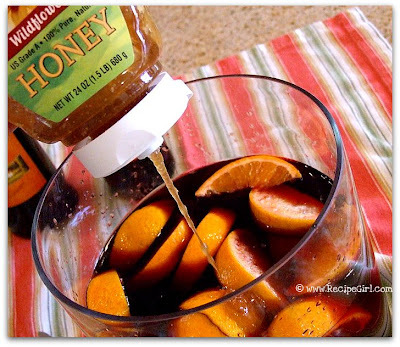 Add more if you prefer a sweeter sangria. 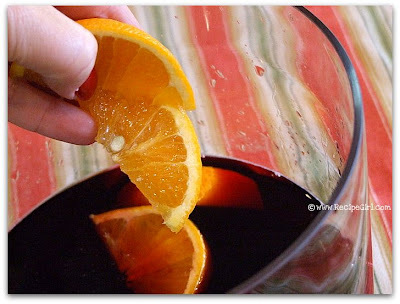 Place your sangria in the refrigerator for several hours for the best flavor. Serve in glasses adorned with little bunches of green grapes- scoop fruit into glasses or serve over ice. If you want to mellow out the flavors (or extend the servings), you can add a bit of sparkling soda. For serving, I prefer to make my sangria in a bowl with a ladle. This makes it easier to scoop up that yummy wine-marinated fruit (which you’ll want to nibble on). I found my cool, cylindrical-shaped bowl at one of those home stores. I’m pretty sure it was meant for flowers but to me it had *sangria* written all over it! 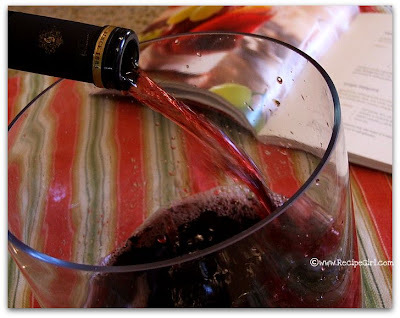 The Sangria recipe was adapted from a cookbook called: Green Black Red: Recipes for Cooking and Enjoying California Grapes, which I won in a giveaway from the wonderful blog A Mingling of Tastes. Thanks Julie! It’s a neat cookbook, with all kinds of ideas for cooking with grapes. This sangria looks like it would go down real smooth. Plus it has fruit in it, so it’s good for you. 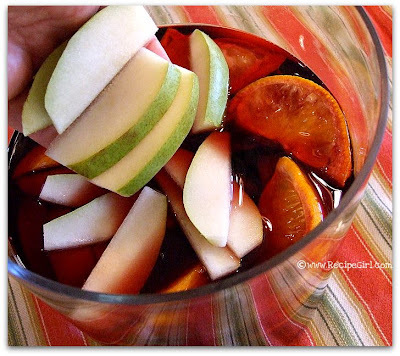 I absolutely love sangria, I can’t wait to try this out!! Look at all that yummy fruit! OMG this is being made immediately!!! I LOVE Sangria, just puts me in a party mood. 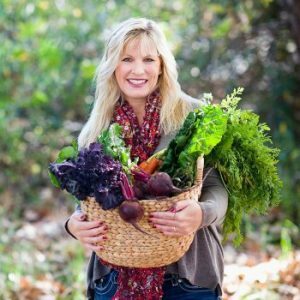 And the fruit makes it seem good for you!